This product is an Authorised Veterinary Medicine and as such we are required by law to obtain certain pet details. These details, allow our Qualified Animal Medicine Advisors to correctly dispense your product. A clear yellow to slightly brownish solution containing as active substance imidacloprid. Each tube contains 0.4 ml (40 mg imidacloprid), 0.8 ml (80 mg imidacloprid), 1 ml (100 mg imidacloprid), 2.5 ml (250 mg imidacloprid) and 4.0 ml (400 mg imidacloprid) respectively as the number listed in the title of the product. he product also contains benzyl alcohol and butylhydroxytoluene (E321) as an antioxidant. For the prevention and treatment of flea infestations on cats and dogs, and for the treatment of biting lice (Trichodectes canis) on dogs. Fleas are killed within one day following treatment. One treatment prevents further flea infestation for up to four weeks on dogs, three to four weeks on cats and up to one week on pet rabbits. 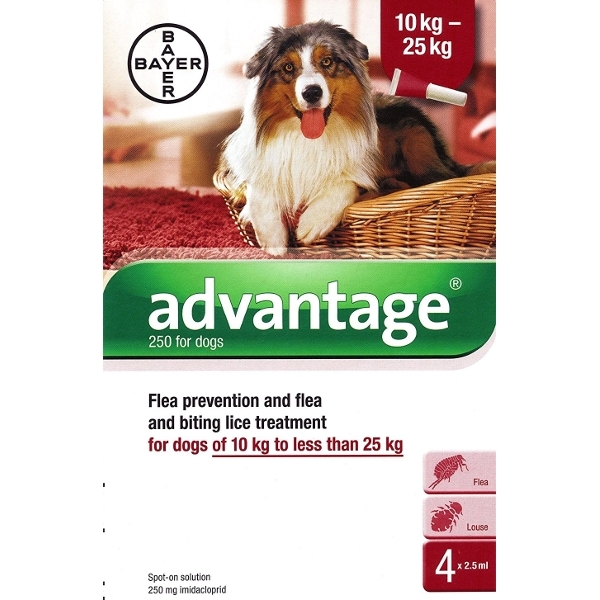 The product can be used as part of a treatment strategy for Flea Allergy Dermatitis (FAD) in the cat and the dog, where this has been previously diagnosed by a veterinary surgeon. Do not treat unweaned puppies or kittens of less than 8 weeks of age. Do not use on pet rabbits of less than 10 weeks of age. Do not use in animals that are known to be hypersensitive to the active substance or any of the excipients. This product is for topical use and should not be administered orally. Care should be taken to avoid the contents of the tube coming into contact with the eyes or mouth of the recipient animal. The product is bitter tasting and salivation may occasionally occur if the animal licks the application site immediately after treatment. This is not a sign of intoxication and disappears within a few minutes without treatment (see dosage and administration). On very rare occasions skin reactions such as hair loss, redness, itching and skin lesions may occur. Agitation and disorientation has also been reported. Excessive salivation and nervous signs such as incoordination, tremors and depression have been reported exceptionally in dogs and cats. No incompatibility has been observed between this product at twice the recommended dose and the following commonly used veterinary products: fenthion, lufenuron, milbemycin, febantel, pyrantel and praziquantel (dogs) and lufenuron, pyrantel and praziquantel (cats). The compatibility of the product was also demonstrated with a wide range of routine treatments under field conditions including vaccination. In cats, no adverse clinical signs were produced using doses of five times the therapeutic level for eight consecutive weeks. In dogs, no adverse clinical signs were produced by individual doses of up to 200 mg/kg body weight (five to eight times the therapeutic dose), daily treatments at 100 mg/kg body weight for five consecutive days or weekly treatments at five times the maximum dose rate for eight consecutive weeks. In rabbits, no adverse clinical signs were seen using doses of up to 45 mg/kg body weight (4 times the therapeutic level) weekly for 4 consecutive weeks. Dogs: In rare cases of overdose or licking of treated fur, nervous system disorders (such as twitching, tremors, ataxia, mydriasis, miosis, lethargy) can occur. Poisoning following inadvertent oral uptake in either man or animals is unlikely. In this event, treatment should be symptomatic. There is no known specific antidote but administration of activated charcoal may be beneficial. The solvent in this product may stain certain materials including leather, fabrics, plastics and finished surfaces. Allow the application site to dry before permitting contact with such materials. Do not use on rabbits intended for human consumption. Wash off any skin contamination with soap and water. After application do not stroke or groom animals until the application site is dry (typically within an hour or so). People with known skin sensitivity may be particularly sensitive to the product. This product contains benzyl alcohol and may cause skin sensitisation or transient skin reactions (for example allergy, irritation, tingling). Avoid contact between the product and the skin, eyes and mouth. If the product gets into eyes accidentally, the eyes should be thoroughly flushed with water. If skin or eye irritation persists, seek medical attention. If the product is accidentally swallowed, obtain medical attention immediately. Store away from food, drink or animal feeding stuffs. Any unused veterinary medicinal product or waste materials derived from such veterinary medicinal products should be disposed of in accordance with local / national requirements. No special precautions for storage. Store away from food, drink and animal feeding stuffs.